4B2-M210AF - M210AF Spring Airsoft Pistol FPS-130 w/ Flashlight, Laser. This gun comes with a laser and a flashlight. It is 7 inches long and made of quality ABS plastic. 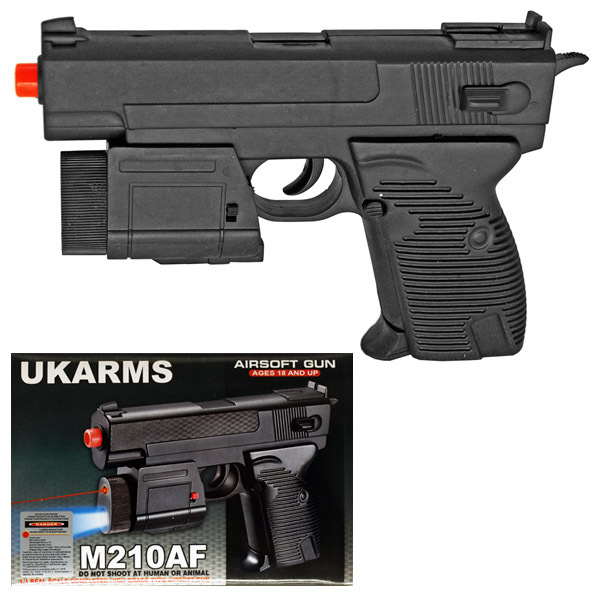 This is a Spring Pistol M210AF Airsoft Gun. This is a fun Airsoft gun for the beginner. This gun comes with a laser and a flashlight. It is 7 inches long and made of quality ABS plastic. This gun shoots at 126 FPS with .12g BBs and has a 9 round magazine. You must be 18 years of age or older to purchase this Airsoft gun. Range: 40 - 50 ft.